The Fastliner has been developed to cut down marking time which, in turn, reduces cost. 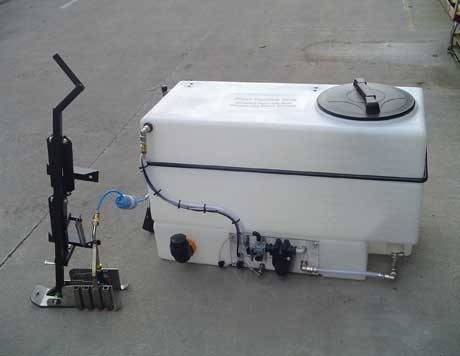 A 150 litre paint tank is mounted onto the back of a utility vehicle or ATV. It has a moulded in scale that helps provide accurate mixing and cost control. Mounted on the side of the vehicle is a patented retracting arm on which the spray system is attached. The retracting arm eliminates the need to reverse the vehicle when marking up to and around goal posts. The arm can be extended and retracted to keep the vehicle on the same driveline. The spray head, very importantly, is downward facing at all times. On the bottom of the arm is the patented line forming ‘ski’. This provides excellent line definition and the option to change the width of the line in a few seconds. The table below gives an indication into the time savings made by using the Fastliner. This then leads to cost savings.